Enter the Nankang NS-2R. This tire is made in 2 different treadwears, a 180 and 120 with the 180 being for the street and the 120 being a track tire. The 120 treadwear is the tire I selected for my car. The following is not really a review of the tire, but just my initial impressions. Normally, I run a 275/40R17, but since the selection of sizes seems somewhat limited and they do not make this size, I went down to a 255/40R17. 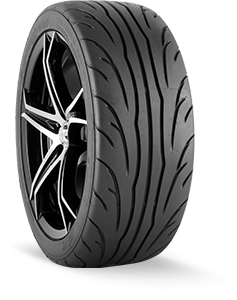 The tire seems wide for its size and is designed for a 9″ wide wheel which is what I have. The tire does seem a little bit shorter than my 275/40 tires, which is expect, but its nearly as wide and doesn’t look out of place. This tire replaced my old Nitto NT05’s. While this tire is not technically in the same class as the NT05 since it is an “R” compound tire, the NT05 was the last tire I was on and has the strongest impression left in my mind. The NT05 was an all-right tire but I thought had a few shortcomings. Namely these were the overwhelming squealing when at the limits, the lack of any wet traction, and quick overheating. The NS-2R is superior in all of these areas and I also feel that the NS-2R has superior grip, but I did not test these tires back to back to the NT05 and my car has changed so much since I had the NT05’s there no real objective way to tell with lap times; but that said, I did notice right away that the NS-2R had more traction. Unfortunately, I did not get to use these tires on the track when they were fresh. I got these tires at the beginning of the season last year (2016) and the date code on them said that they were manufactured in late September 2015, and before I went to a track day, I found that I had some major engine problems that I couldn’t quite figure out. During my time troubleshooting, I put some street miles on these tires and did notice that they did get harder – just like a proper R-compound tire. After performing a major overhaul and tying up a lot of loose ends, I finally finished the car and was able to take it out last weekend to Gingerman Raceway for Gridlife (10/7/17). So the tires were already about two years old and had some street miles on them. But, it turns out, they still had life left. I noticed that they warmed up quickly and provided an impressive amount of traction. Much better than my old NT-05’s. Most impressive was the grip under braking. This is where things get a little tricky with comparing things on my constantly changing car. When I was on the NT05’s, I was running a Performance Friction brake pad which were not very aggressive. With that pad, which was designed to prevent locking the wheels on light weight cars, I was able to bring the tires to the edge of traction with the brakes fully applied. I felt that there was more stopping power left so I stepped up to a more aggressive pad – Wilwoods H compound. With this pad and tire combo, I had to work on my stopping distances because I could go deeper than before and I was not use to this new level of traction. I still think I haven’t used all the traction under braking and would like more seat time to feel it out. The tires also held up well and did not over heat. I was running 20 min sessions in a fairly powerful car and I never felt these tires get greasy or have a drop off in performance. I tested this on a sunny and humid 80° day. The only down sides with this tire I can think of is that the 120 treadwear will keep it out of street tire classes. At the limits of traction, I noticed the tires made some noise. But its minor and nothing like the high pitch squealing of the NT05’s. This noise also made the tires easy to drive as this made me aware of the limits, though, this could be due to the age of the tires. I have heard from other sources though that these do make some noise even when fresh. Overall, I think this is going to be a great tire and and the price is unbelievable. I can only imagine how much better they will be when fresh. This is definitely a tire worth checking out if your not doing any real serious competition. Figure that these tires have about the same performance as some of the hot 200 treadwear tires on the market now, but cost quite a bit less. To do a more objective test, I need a fresh set and measure lap times and temperatures; but even now, I can tell these tires have potential. I would treat these tires like you would any R compound tire. They should not be street driven (at least the 120 treadwear ones) and really deserve their own set of wheels if your car is street driven. « Is it possible to make modern power with a gen 1 small block chevy?